Penn's Grove Middle School teachers nominate Students of the Month for each grade level team, based on their academic achievements and participation in class and school activities. 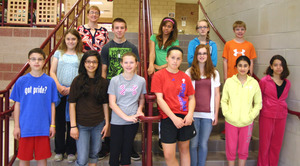 Pictured with principal Lisa Stenz, Penn's Grove Middle School seventh grade Students of the Month for April are (front, from left) Joe Schaefer, Amairani Reyna, Hannah Levan, Tara Bender, Ellen Stroud, Samira Barimani and Jessica Morales. Top, from left, are Katelyn Townsend, Steven Yannucci, Brianna Murray, Shaylee Townsend and Andrew Olejnik. 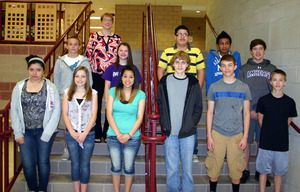 Pictured with principal Lisa Stenz, Penn's Grove Middle School eighth grade Students of the Month for April are (front, from left) Estrella Gonzales-Gomez, Amanda Gunzel, Giselle Rosa, Tyler Johnston, Matt Krivansky and Cyle Johnson. Top, from left, are Michael Montgomery, Maddie Rector, Elmer Arroyo, Yudiel Perez Vazquez and Sam Wood. Mykhial Brown is not pictured.